Nob Hill: More evidence that the John Barleycorn was one of the city's most beloved bars: exactly a year after the epicstruggle to keep the Barleycorn from being shuttered at the hands of Luisa Hanson, a sizable, hand-crafted letter/memorial has adorned the facade of the old bar. 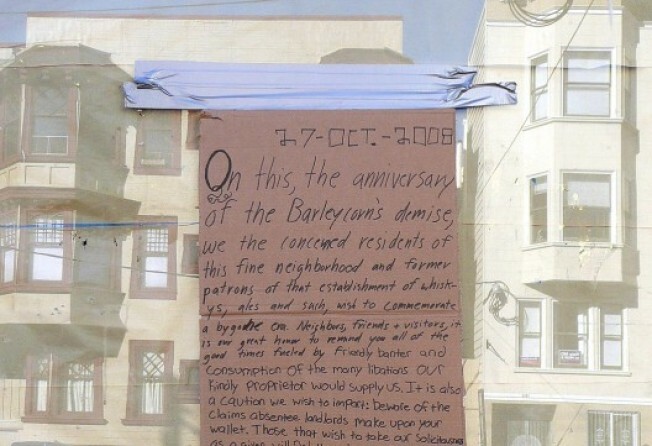 It's at once an ode to the bygone days of the Barleycorn, a declaration of condemnation of the new (unopened) resident Duffy's, and a plea for neighbors to not support the new regime. Speaking of which, after some headway back in the spring, the two projects on the corner—Duffy's and 1500—have sat in a stasis for months, leaving many wondering if they'll ever happen. On this, the anniversary of the Barleycorn's demise, we the concerned residents of this fine neighborhood and former patrons of that establishment of whiskys, ales and such, wish to commemorate a bygone era. Neighbors, friends and visitors, it is our great honor to remind you all of the good times fueled by friendly banter and consumption of the many libations our kindly proprietor would supply us. It is also a caution we wish to impart: beware of the claims absentee landlords make upon your wallet. Those that wish to take our solicitousness as a given will find themselves sadly without, as we take a stand to set not a single toe inside the building we once held dear. Our hard earned dollars will be exchanged for punch and other such beverages at various locations throughout our fair city, but never again 1425 Larkin Street. We ask that all who chance to read our humble note sit with us as we cheers that man, John Barleycorn, at whatever OTHER haunt we see fit.